NEW : closed fence and pool area - wifi 'pay as you go'. Secure Parkingspace on our own ground. 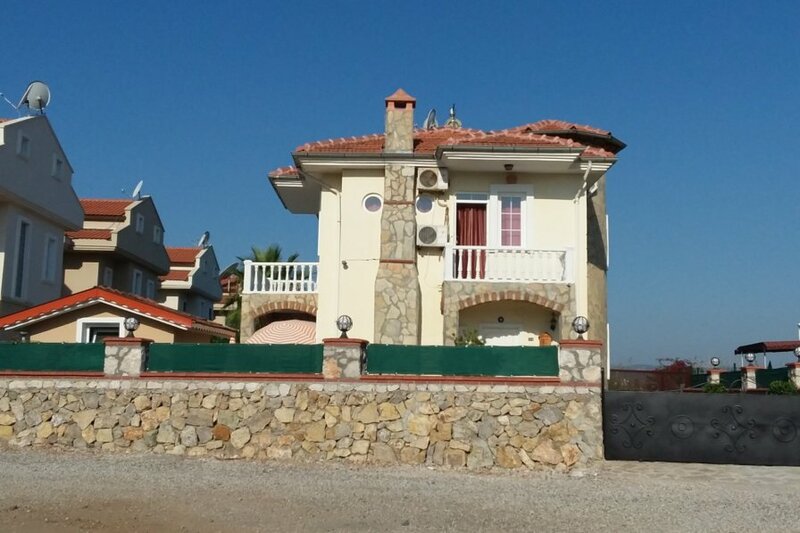 A luxury and spacious, detached villa with 2 terraces and 3 balconies. It has a private swimming pool and its situated in a very small development, set in its own ground, 400 m from the sea, with magnificent mountainviews.Every bedroom has its own balcony. will welcome you at the villa and give you all the information about the area, excursions, carhire, boattrips, shopping, etc. and they ll also arrange the transfers to the airport. We provided all that we can to make your holiday enjoyable. You will find some games(pc and boardgames),dvd and music cds. The pool has also a very nice size for a good swim. Outside shower and nice wooden fence between the villas next to the pool. WIFI 'pay as you go' available in the villa. At the beach you can use free WIFI from the restaurants (400 m from the villa). ***NEW: Digiturk satellite TV with Live Premier league football, Formula 1, Eurosport channels , comedy channel and film channel in English ,documentary channels (History Nat Geo etc.) and children’s channels in English. Located in a quiet area, near by the beautiful " Turquoise Coast " with his stunning seaviews. On the beach, 400m from the villa, you can enjoy your meal in one of the beach restaurants,or have a drink in one of the bars.Also a surfclub near by. Within a walk of 5 min.you find a few local food shops. Taxioffice + ( dolmusstop) :100m from villa. Within easy reach of Calis, with his many shops, bars and cosy restaurants on the beautiful promenade. Also located on Calis beach, the Sultans Aqua City Park, a very well equiped waterpark, which offers many hours of pleasure for the entire family. You can also reach easily Fethiye, also with many restaurants, supermarkets, all kind of shops, a beautiful harbour and a weekly market on tuesday. The location of the villa is ideal to visite different beautiful places and historical sites. Göcek, the small harbourtown, the bay of Ölüdeniz, the famous bleu lagoon,which is also famous for paragliding and recent voted to be one of the best beaches in the world, Dalyan with his turtle beach, Patara, 18km long beach of real white sand and dunes, Saklikent gorge, Tloss and Yaka Park, Kaya Village, the hillside ghost town and Xanthos. Villa "Mavi Deniz"is a new privately owned detached luxury 3-bedroom villa .Ideal for a relaxing break.In a very short walking distance, you can take a dolmus or taxi to Calis(5min),and Fethiye(15min) with its numerous restaurants, shops, stunning sea views and beautiful sunsets. You also can take the watertaxi to Fethiye, it will take you right to the harbour .